Do you need additional space in your garage, but it’s too narrow and there is not enough room for your cars and cabinets or wall-mounted storage shelves? Perhaps you’ve recently downsized and still have a lot of belongings. Maybe your garage space already has existing storage but you still have additional stuff that you want to get off the garage floor. Or you’ve collected so many holiday lights and decorations and need a place to store them. No matter the cause, the only way you can go now is up. In other words, ceiling mounted storage shelves are an ideal solution to fulfil your storage needs in any of the above circumstances. Getting your boxes, bins, tires, and even those bikes up and off the ground onto the ceiling rack is practically the best way to reclaim your garage space. This smart storage solution will help keep your items off the floor and within easy reach. 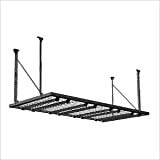 Below is a review of the best ceiling mounted storage racks. 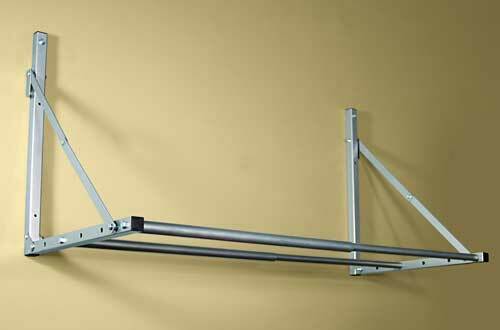 This storage rack fits almost any garage and features a full 600-pound capacity. It’s adjustable from 24-inch to 45-inch from the ceiling. 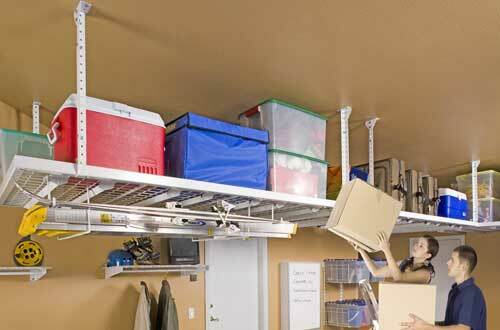 This adjustable height allows it to fit in any garage. The rack is designed for durability and strength. 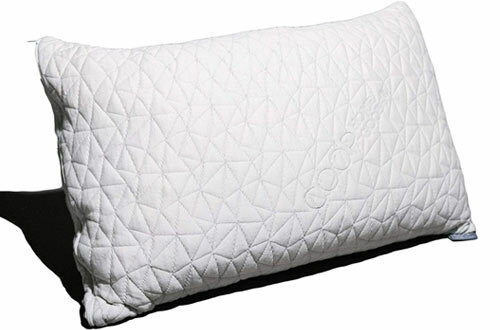 It features a heavy-duty design and is made of industrial grade steel and a durable white powder coat finish. The patented ceiling brackets provide the safest connection. 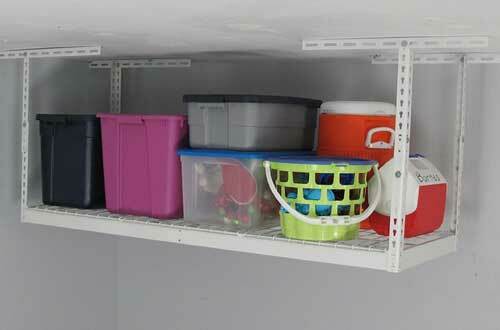 This storage system is designed to take full advantage of the unused ceiling space in your garage so that you can finally get those stuff off your garage floor and have them organized into shelves. 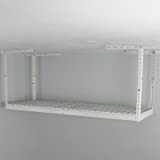 This ceiling storage shelf is made of durable steel with a beautiful scratch-resistant and rust-resistant white powder coated finish. 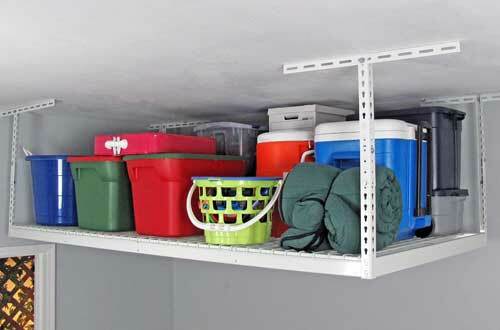 With a load capacity of 250 pounds, you can store even your big items using this garage storage shelf. 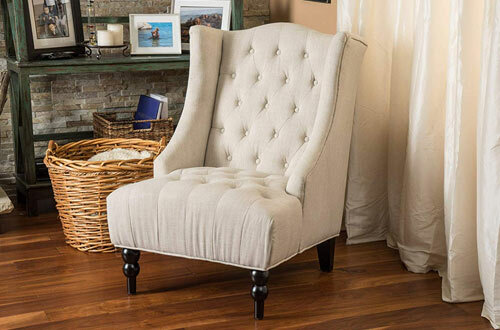 It’s about four by four feet and features an adjustable height from 16 to 28 inches. This is the ultimate storage solution, combining flexibility and durability. With this folding storage loft, the storage options are only limited by your imagination. The loft is entirely made of strong and long-lasting steel tubing and has the capacity to hold up to 300 pounds of weight. It’s ideal for storing season tires, ATV tires, RV tires and much more. It can accommodate up to 4 standard vehicle tires with ease. 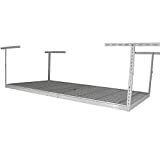 This storage loft is lightweight, easy to install and features an adjustable width. 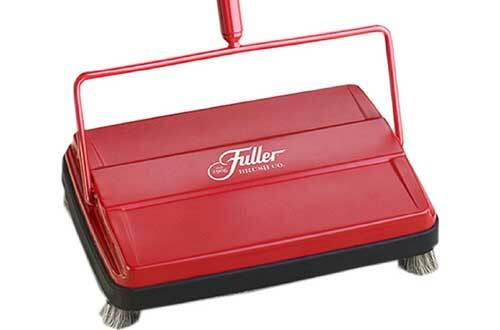 It folds easily when not in use and features a scratch resistant silver powder-coated finish. 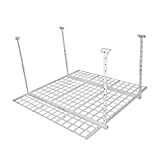 This storage rack from SafeRacks provides you with a smart way to manage your storage space in an organized manner. 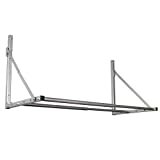 Ideal for basement and garage, this rack is made of industrial grade steel with powder coated finish for long-lasting good looks and strength. 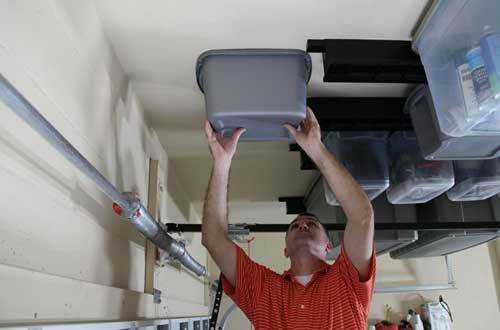 It’s customizable from 12-inch to 45-inch from the ceiling and is designed to hold up to 300 pounds. 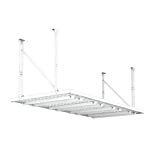 The unit includes 4-inch by 4-inch overhead rack, installation instructions, and a mounting hardware. This is a great starter when an ordinary rack won’t fit your available space. 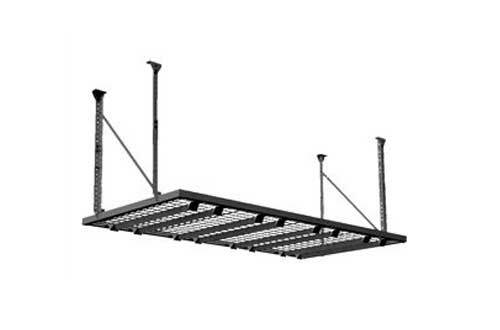 With a capacity of 600 pounds and an adjustable height of up to 45-inch from the ceiling, this overhead storage rack is a great fit for any garage or basement. The rack is manufactured from industrial-grade steel with a powder coat finish and comes with step-by-step instructions. 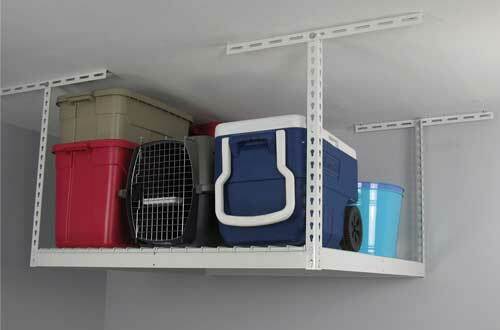 This item adds a lot of storage space to your garage. It’s very easy to install but it would be wise to take your time up front to make some measurements. It’s important that you space the ceiling-mounted brackets exactly a described in the instructions. In case you aren’t at ease with finding ceiling joints and making exact measurements, then it wouldn’t hurt to get some help. However, as soon as the brackets are installed, the rest of the installation is very easy. If you’re in search of an affordable, simple and reliable storage shelf solution, then this is the product for you. Please understand that the actual shelf board isn’t provided, only the wire and screw eye anchors are provided. You need to buy the plywood locally and have it cut for you. Installing this unit is very easy. Before you install the plywood shelf, remember to check that all the eye-bolts are even and adjust if necessary. This storage system is very sturdy and built to last. The easy to install unit provides an effective way to eliminate the clutter from your home. 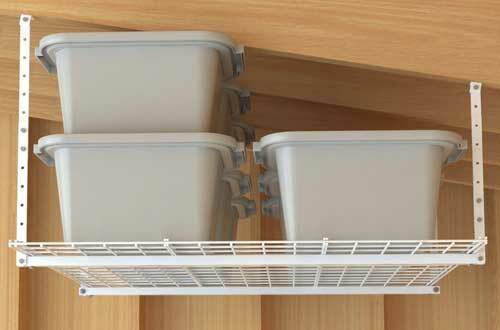 You can easily rotate the storage from either one or two ends, depending on where the bin caddy storage is placed. If you like, you can order a minimum of two kits so as to take full advantage of the storing capacity of the double sided-rails. For example, one kit consisting of four 2-foot rails can accommodate three of the top hinged twelve-gallon storage container available at most stores. 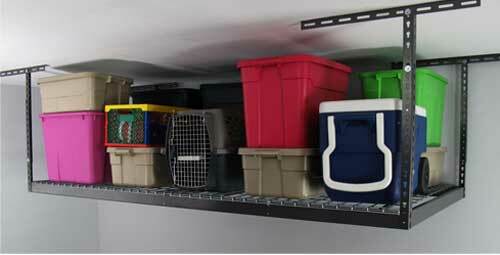 But, if you purchase two kits, you’ll be able to hang nine of the same top hinged twelve-gallon storage containers. Perfect for someone with limited space, this unit allows you to get items off your garage floor and arranged on shelves instead. The shelf comes in a sturdy black hammer-tone powder-coated finish. It’s easy to install and adjusts to several different heights. 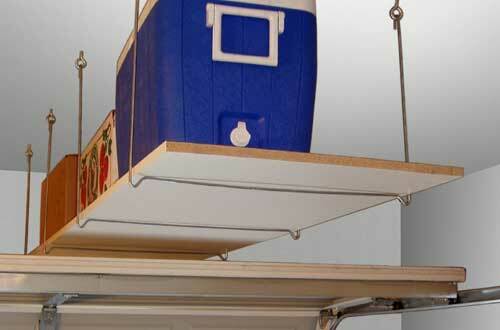 With a weight load capacity of 600 pounds, even your large stuff can be stored on this shelf. 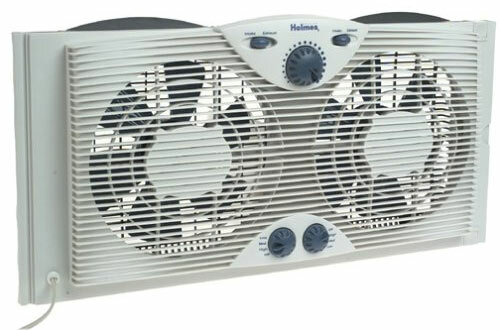 This affordable unit is very easy to install and use, and is packed with useful features. Built to last a lifetime, the unit offers an ideal space saving solution for garage or any other storage space in your home. It comes with clear instructions, making it even easier to install. The rack fits almost any garage and features a weight capacity of 600 pounds. 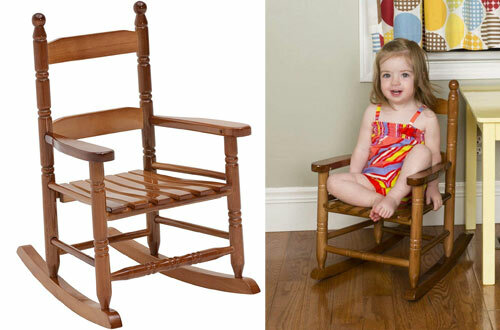 It’s adjustable from 24-inch to 44-inch. 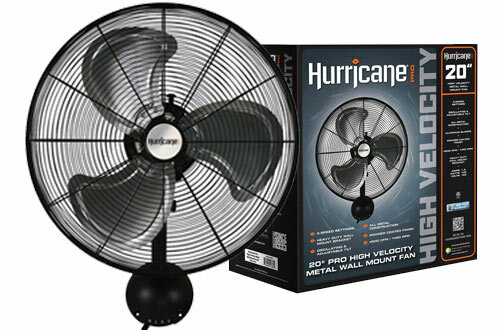 The unit features industrial strength steel construction with a hammer tone powder coat finish.